Friend getting married? These blank bridal shower invitations will be perfect for her bridal party. A bridal shower really adds to the excitement and fun of a marriage for everyone. And it gives you a last chance to spend time with the bride-to-be as a single person. 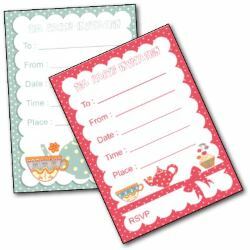 These lovely invites print two per page to save you time and ink. And the beautiful design makes a great way to invite your guests. Tip: If you need to add extra directions to your event, then you can use the back of the invite. Lovely pink bride design. This is one of my favorite shower invites. 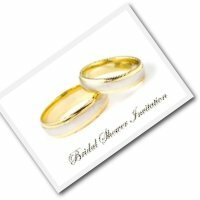 Would you like wedding invitations to match? There are matching wedding invitations here. Bold red bride design. For those who don't think pink is pretty! 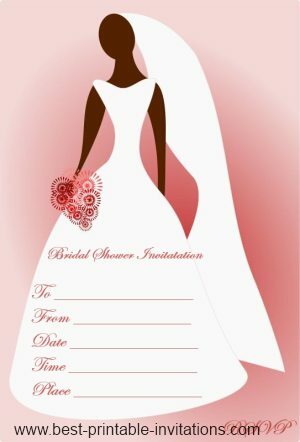 Printing these bridal shower invitations is easy to do. Just select the design you like to open the invite in a new window. Right click your mouse and select print. On some printers, you may need to switch your printer settings to 'landscape' to print the invite correctly. They will print nicely on ordinary photocopy paper - but a heaver weight paper gives a more expensive look to your invites. The invites are blank and ready to be filled in with your shower details. Just cut the invites apart and they are ready to use. You may want to make a guest list first - then you can cross people off the list as you go. This is particularly important if you are organizing a large party - according to Wikipedea, some bridal showers can have over 300 people attending! The invitations doesn't really need any extra decoration - but using a pretty gel pen will make them look nice after they are written out. 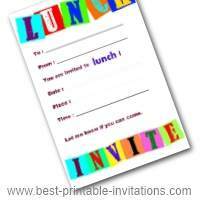 You could also decorate your envelopes. 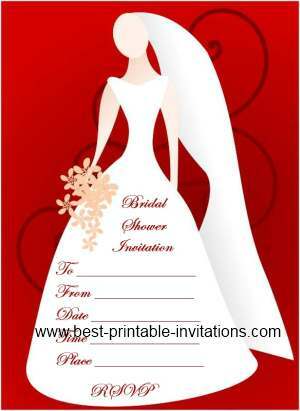 Why not print extra blank invitations and cut the top part of the bride out to stick to the envelope? Or add a little confetti into the envelope to surprise your guests! If you are a little nervous about organizing the event, then do check out these ideas for bridal showers. I hope your event goes smoothly, and everyone has a great time!